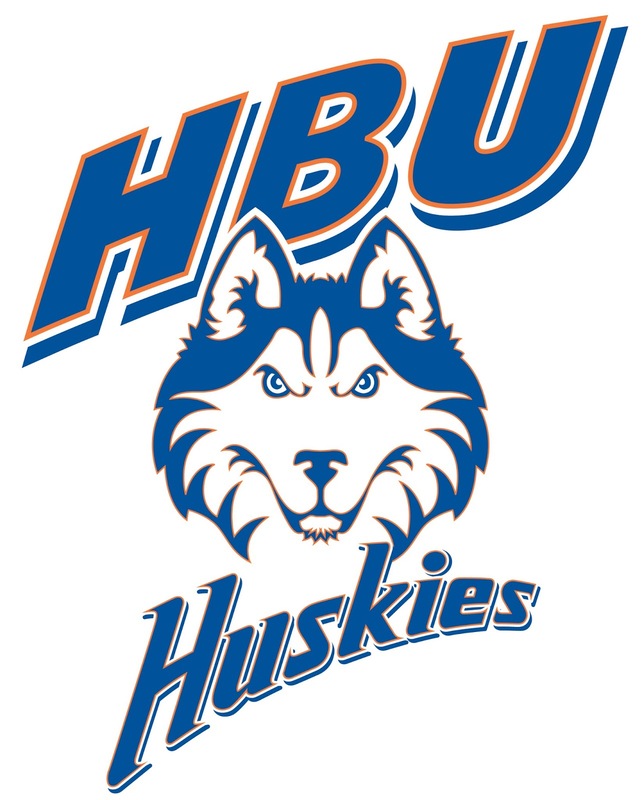 HOUSTON, TEXAS (April 24, 2016) HBU head track and field coach Theresa Fuqua and her staff have announced eight more student-athletes, including one in the top three in the nation in the high jump, to National Letters of Intent to compete for the Huskies in 2017. 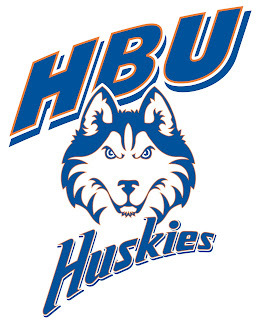 Samara Hodges comes from Mayde Creek High School in Katy, Texas. She is currently tied in the state lead in the high jump with a leap of 5’10”. Hodges’ mark also has her tied for third in the United States amongst high school girls. This season she has won seven of her eight high jump competitions. Tatyana Jones is a hurdler from Centennial High School in Boise, Idaho. She was the 2015 Idaho state champion in the 300 hurdles with a time of 43.71. Brandy Thomas competes in sprints at Lamar High School in Houston. Thomas’ specialty will be the 400 meters. She has a PR of 57.20 and is the 2016 District 20-6A Champion. Sarah Tabor is a distance runner from Needville High School who will specialize in cross country and the longer distances on the track. Tabor finished fourth at the 2014 4A UIL State Cross Country Championships. Imani Jacquet is a thrower from Goose Creek Memorial High School in Baytown, Texas. She is the 2016 District 22-5A Champion in the Shot Put and Discus. Jacquet has a shot put PR of 39-6.5 and is currently ranked 16 in Texas in the 5A division. Chantel Ward is another thrower from West Columbia High School. She will specialize in all throwing events and is currently ranked eighth in the state of Texas in the 4A division. Fuqua and her staff have signed two men who will specialize in jumps in Dominic Swoopes and Shemar Smith. Dominic Swoopes will compete in hurdles and jumps and comes from Kingwood High School. He has PRs of 14.87 in the 110 Hurdles, 38.29 in the 300 Hurdles and 22-0.5 in the Long Jump. Dominic was the lead leg for Kingwood at the 2015 State Championships that won with a time of 3:12.44. Shemar Smith competes in sprints and jumps at Whitehouse High School. He has PRs of 10.44 in the 100, 21.84 in the 200 and 22-5 in the Long Jump. Smith is the 2016 District 16-5A Champion in the 100 meters and his 10.44 mark puts him as the Texas leader in the 5A division. Alex Monteiro De Lima (14) goes up for a header versus Seattle. 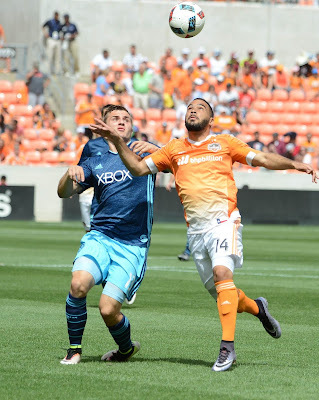 HOUSTON, TEXAS (April 10, 2016) The Houston Dynamo scored with 10 minutes remaining in the first half and held on until added time in the second half when the Seattle Sounders scored the equalizer to tie the score a 1-1 at BBVA Compass Stadium on Sunday, April 10, 2016. With the draw, the Dynamo moved to 1-2-2 for the season, while Seattle posts a 1-3-1 record. The draw was the second of the season at home for Houston and raised their season point to four. The Dynamo goal, which came in the 35th minute, was scored by forward Giles Barnes and was the second of the season for the Houston captain. The assist was credited to defender Jaili Anibaba, his first for 2016. The draw was the fourth all-time for the Dynamo against the Sounders, with Houston remaining unbeaten against Seattle in Houston. They have three home wins against Seattle in six meetings, with three games ending in a draw. In their last matchup, they battled to a 1-1 draw on October 18, 2015 at BBVA Compass Stadium. The draw was also the second for Houston head coach Owen Coyle against Seattle, who now posts a 0-1-2 record against the Sounders. In the final seconds of the four-minute added time, Seattle forward Oalex Anderson sent a pass from the far post to defender Chad Marshall, who tapped it past Houston goalkeeper Joe Willis for the draw. The goal was Marshall’s first of the season and Anderson’s assist was his first of 2016. Next up for the Houston Dynamo will be a rare Friday evening game, on April 15 against the Los Angeles Galaxy. Kickoff is set for 6 p.m. CDT in Houston, The Sounders will host Philadelphia in their next match, on Saturday, April 16, 2016.